There is no such thing as an ideal mentor. That’s an idea it took me a long time to understand. Every person I had heard speak about mentoring spoke about their mentor as if he or she were a omniscient fairy godmother guiding them through life. I tried finding that one person who would guide me through the ups and downs of my career, imagining teachers and professionals I admired as that go-to person, trying out formal mentoring programs to no avail. Then I heard a take on mentoring that completely changed the way I looked at it – the idea that everyone should have their own personal board of directors filling that role of mentor and advisor. It took a while for the ideas to stick, but when it did, it made so much sense. I don’t depend on just one person for advice in any other area of my life, why would I expect one person fill that need professionally? Like an organization needs a board full of people from different backgrounds with varied experiences and perspectives, so too do professionals. No lone person will have had the same exact experiences you will, so having a pool of trusted advisors will help you grow and develop in a variety of situations. You don’t need to fill out your board of directors all at once – that will happen over time. You do need to make sure there is variety in who you’re approaching for advice, though. It may seem like quite an undertaking to find people, but I’m sure if you take a good look at your own network, your board of directors will begin to take shape. Looking amongst your own circles makes a lot of sense when you think about it. For a mentorship to be successful, there needs to be trust, common values and common interests. A mentor needs to be someone you respect and with whom you mesh, so looking to people you already have a connection with is a great place to start. If you feel there’s little variety in your network, try casting your net just a bit wider to your PRSA chapter, your alma mater’s alumni network and your network’s network. Asking to connect with strangers becomes a bit easier when you already know you have something in common. One-on-one coaching like a traditional mentoring relationship may work for some, but it’s not the only way. Like any other relationship, a mentorship should grow and change over time. Being mentored is an ongoing process, not an accomplishment or item to check off along your career path. It’s something that takes work, time and dedication. And much like other things in your life – your relationships, your professional development, your own well-being – you get out of it exactly what you put into it. Looking to learn more about building a successful mentoring relationship? Join us as we partner with the College of Fellows for Supercharge your career: How finding or being a mentor can transform your professional development, a webinar to discuss the ins and outs of mentoring. Register now. 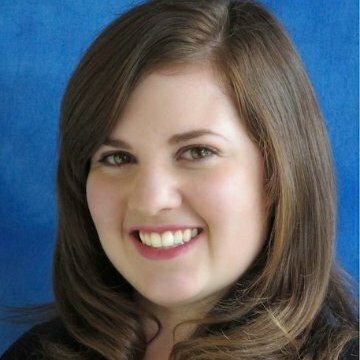 In her fourth year on PRSA’s New Professionals Section’s executive committee, Robyn serves as 2019 chair. She’s a native of southern New Jersey and currently resides in Washington, D.C., by way of Pittsburgh and South Carolina. Robyn currently works for Airports Council International – North America (ACI-NA), a trade association representing North America’s airports, and holds a bachelor’s degree in Public Relations and a master’s degree in media arts and technology, with a focus on creative media practices, both from Duquesne University. She likes to spend her spare time cooking, reading, exploring, crocheting and spending time with her tail-less cat, Izzy. Learn more about her on her website or find her on Twitter & talk to her! 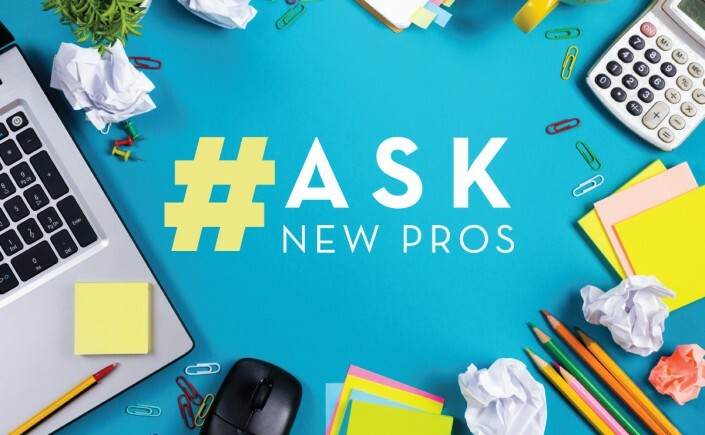 This is part of our recurring #AskNewPros series. Do you have a burning question for PRSA New Pros? Ask us! 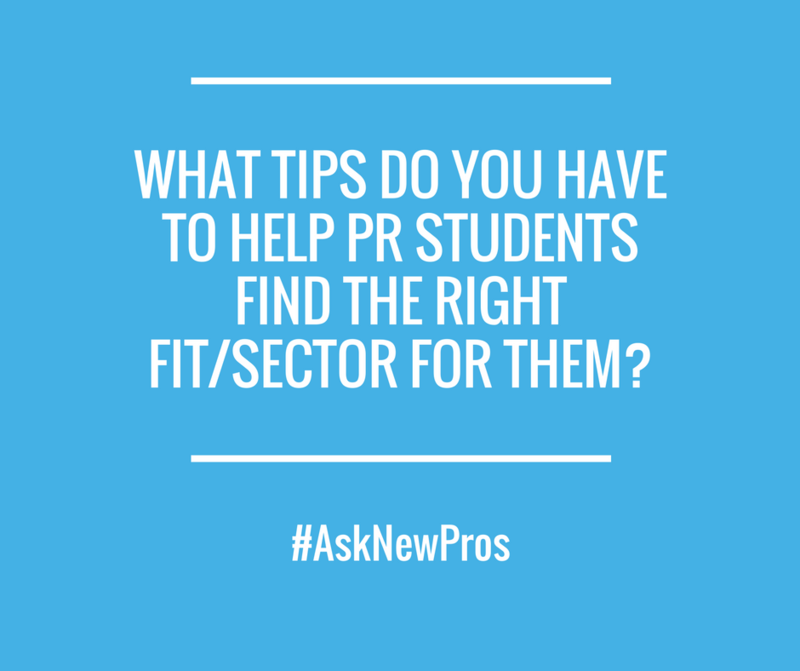 What tips do you have to help PR students find the right fit/sector for them in the industry? The best way to figure this out is to first think about what motivates you. What’s going to make “work” exciting for you? It could be anything! Is it the brand, the organization, working with social media, or working with traditional media? All of these things play a factor in figuring out the right fit for you. Honestly, it’s hard to figure out until you’re in it. That’s where the value of interning comes in. I know PRSSA drills this into your head, but it’s true! Interning allows you to try out different roles and sectors so you can figure out your likes and dislikes. Beyond just what sector and roles are good for you, you can also learn what kind of workplace environment you want to work in. Maybe you thrive off the intensity of a start up or benefit from larger teams? You’ll never know unless you try! Plus, you may find out that work climate and team dynamics contribute more to your overall happiness and fit even more than what industry you’re working in. Your time in college is a great time to explore all of this! Take on as many roles and various sectors as you can while you have the time to explore. It’ll help make your eventual job feel a lot less like a “job” after all. Jenna Mosley is a PRSSA liaison on the PR New Pros executive committee. She works for the Campaign for Tobacco-Free Kids as the International Communications Associate in Washington, D.C.
Editor’s Note: This post is part of our ongoing #MemberMonday series. 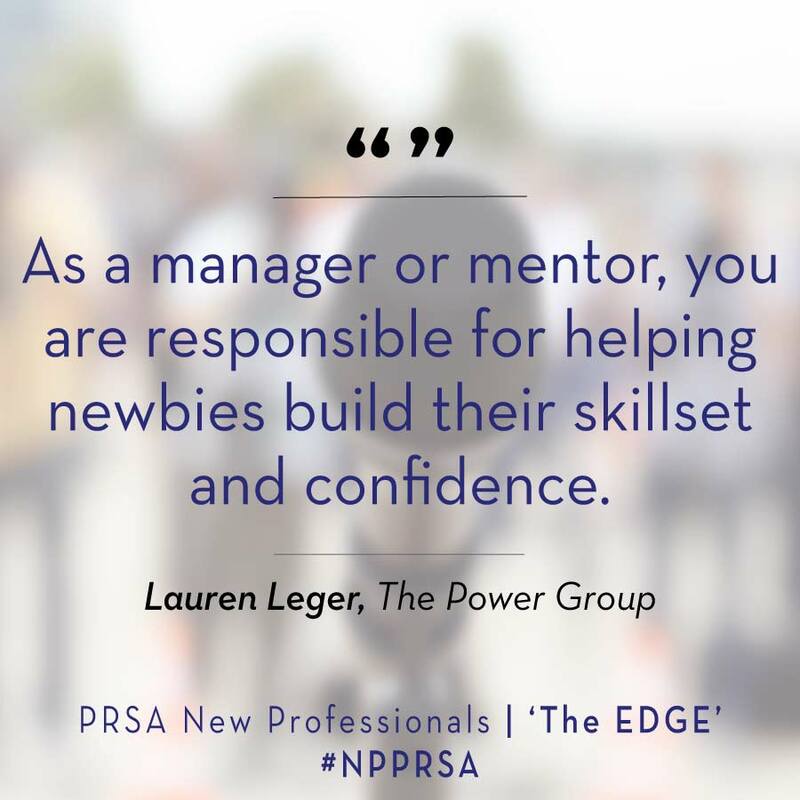 Each week, we will share content focused on our New Pros members and how PRSA benefits them. 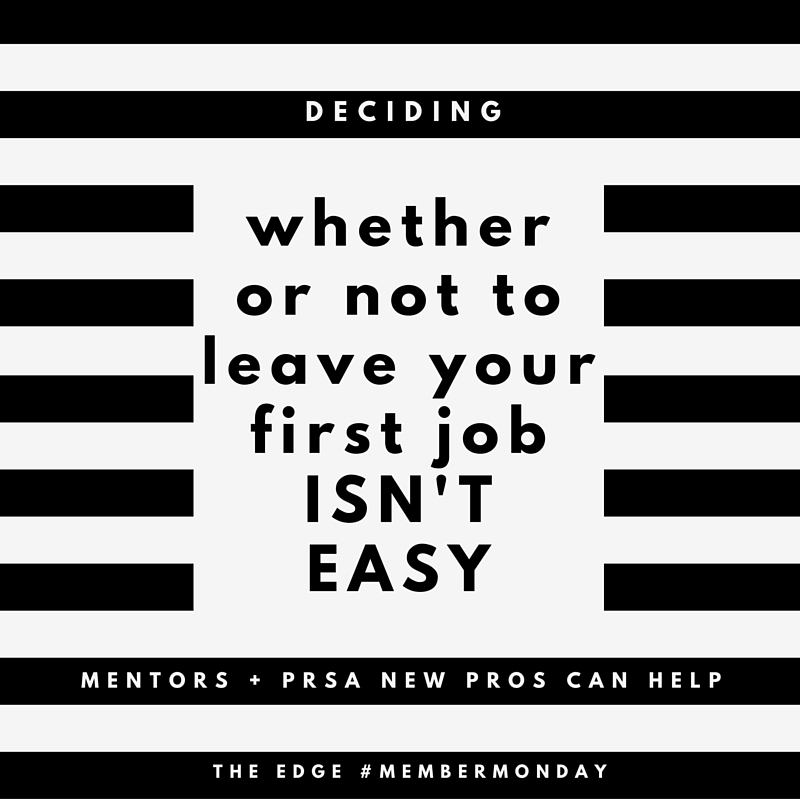 Follow us on Twitter at @PRSANewPros and share your stories using #MemberMonday. Deciding whether or not to leave your first job isn’t easy. There are a lot of questions to consider. Is it the company you don’t like or is it the industry? Is it the agency world or your particular agency? Have you done all you can to grow and love your job? Do you want to relocate and, if so, can you afford it? Fortunately, mentors and other resources can help. As I debated whether to leave the agency world, here are a few lessons I learned from my mentors. When I started considering a career change, I decided to consult my mentors. Fortunately, I’d been building up a network for the past couple years, so it was easy to think of people to reach out to. Seasoned professionals. These are the well-connected, executive-level people who can relate best to the hiring managers who will be looking at your resume. Young professionals. Mentors who were where you are just a few years ago can relate to what you’re going through and offer timely advice. Mentees. I’ve found my mentees are so wise that they end up mentoring me in the process. 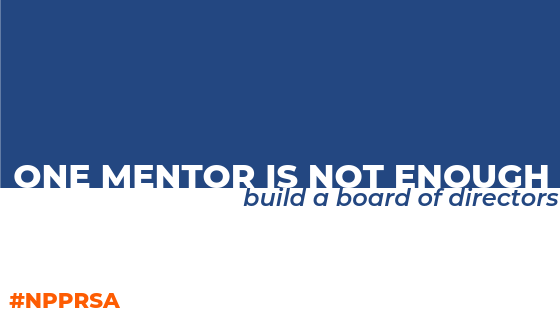 Don’t have mentors yet? 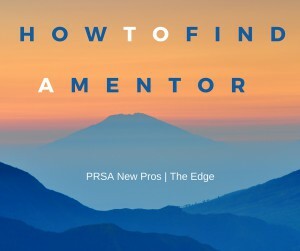 PRSA Mentor Match is a great tool PRSA members can use to connect with seasoned professionals. I developed a corporate mentor who was very helpful in my decision. I, like most Millennials, was worried my résumé would look bad if I left my first job before the two-year mark. But then a mentor told me that’s a myth. Sure, some PR people may think you look like a job hopper, but it all comes down to the story you tell. As long as you have a good story for why you jumped and if you are truly concerned with finding the right long-term fit, it shouldn’t matter if you leave your first job earlier than expected. The key is to make sure you are making this change for the right reasons and that you’ve done all you can to be happy in your first job. Before leaving, outline the path you’d like your career to take. Will your current job help you get there? Have you done everything you can to carve the path you want? Have real conversations about your goals with your supervisor before deciding to leave. Two people recently told me, “Your career is too short to be unhappy with your job. Why stay if you aren’t happy?” It seems so simple, but it can be hard to come to terms with. Just remember, there’s a difference between having a bad week and having a bad job. Everyone will have opinions about your career path. But no matter what they tell you, you’re the only one who will be with your employer for 40-plus hours a week. You’re the one whose career is on the line. Sure, some people will still tell you that you have to stick it out for a year or two. But in the end, it’s your decision. Make the one that feels right. 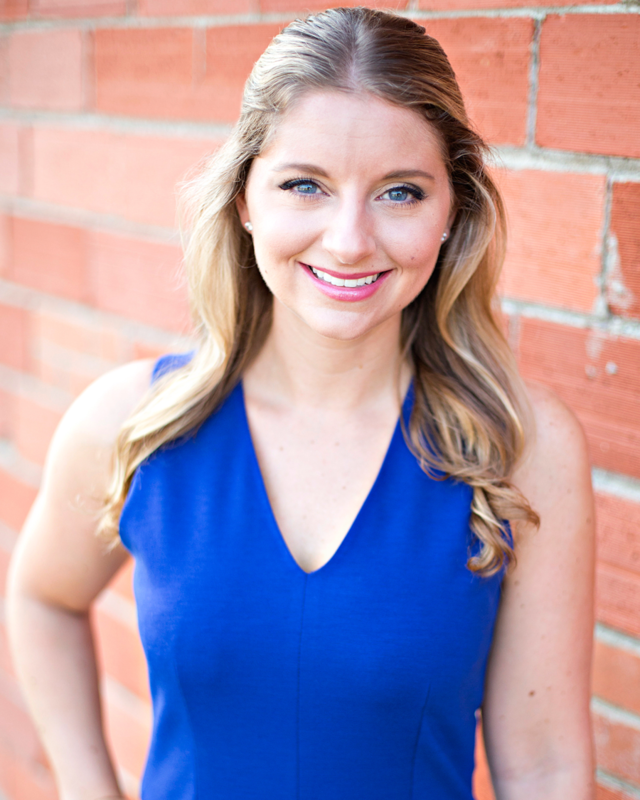 Heather Harder is the programming co-chair for PRSA New Professionals and a former national president of PRSSA. Follow her on Twitter at @HeathHarder. 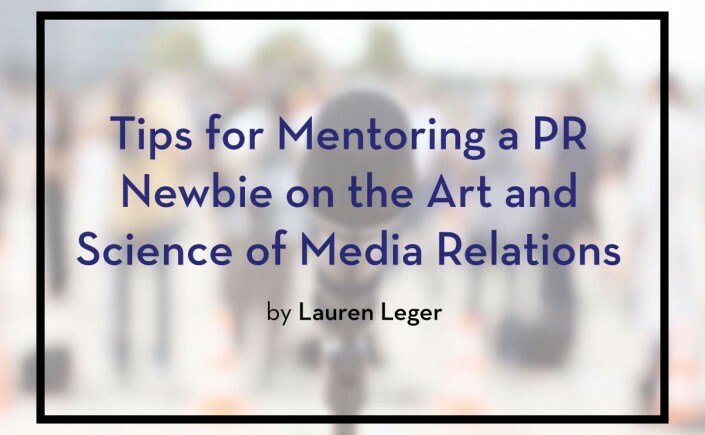 So you’ve been asked to train, mentor, or manage a PR newbie on all things media relations. Congrats! Now what? Media relations is an art and a science. Mastering the balance takes practice, and can be challenging to new PR pros starting out in the workplace as an intern or account coordinator. While some colleges teach media relations, many do not, and those that do often only skim the surface. That being said, those starting out in the PR world could use media relations guidance – a task that often falls on more senior account coordinators, or account executives and account supervisors. Often the shift from new pro to “less new” pro, responsible for helping out the greenest team members, can be tricky. Here are some helpful hints that I’ve found to be helpful, both as I’ve been mentored and have mentored others. 1. Remember that patience is a virtue, and encourage questions. 2. Show and tell – employ a “face-to-face” edits model. If you receive a less-than-stellar media list from a new pro, don’t be afraid to call him or her over to your desk and go through the list, talking through your thought process. It’s easy to hide not-so-nice feedback behind an email chain, but I’ve found that sharing insight into your own process can be really helpful for new pros. If you’re making a personal connection and talking through your own media relations lessons learned, even better. Don’t hesitate to talk through mistakes made by the intern or account coordinator. It can be tough to deliver that feedback, but it’s crucial for the mentee to hear in order to improve. 3. Give your mentees plenty of opportunities to watch and learn. I learned so much from my first media relations manager simply by watching how she composed an email to a journalist, coordinated an editorial, or approached booking trade show press appointments. A great (and risk-free) way to learn is simply to soak up everything like a sponge. As a mentor, that means including your mentee in every media relations activity you possibly can. Sitting in on client interviews, tagging along to broadcast segments, and observing media training are all great learning opportunities. Leveraging industry publications and organizations, such as PRSA and Cision, is also a great way for mentees to learn. Mandatory webinars and lunch and learns are a great way for an intern or account coordinator to “familiarize faster,” according to my account supervisor Jordan Liberty. What are some of the more helpful things your direct supervisors have done to guide you in your media relations learning? What are some tips that you would add to this list? So, you want a mentor. You realize that at this stage in your career, you can benefit from building a relationship with someone who can guide you in your journey. If you’re really savvy, you already know that a mentor is not something you “get,” but someone who you come to know, trust and confide in. Here are some ways to find a mentor. 1. Identify your purpose for finding a mentor. It’s important to know what you want in the mentoring relationship. Whether you’re actively job hunting or trying to identify the next step in your career path, knowing what you want to achieve will help you find a great mentor who can help you navigate the terrain. 2. Broaden your definition of a mentor. Mentors come in all shapes and sizes. Some are lifelong coaches, others are confidants for a short period of time. You may find a mentor with wisdom in all things, or someone who is uniquely positioned to help you through a specific challenge. Remember, when looking for a mentor, consider the person, not their position. Your peers and colleagues may have experiences and perspectives that prove useful. 3. Participate in a structured mentoring program. Established mentor match programs are great, because they jumpstart the process of building a meaningful relationship by introducing you to someone who is ready to be a mentor. 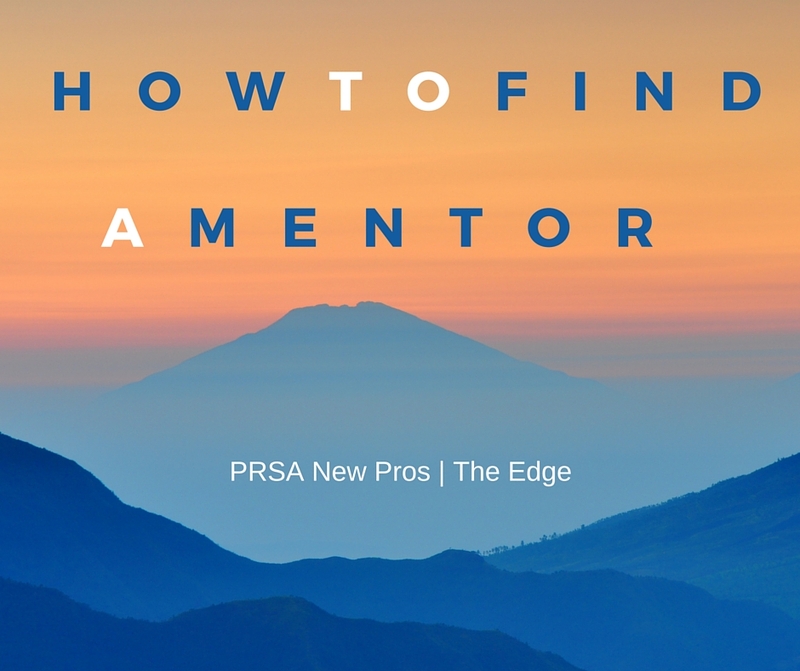 The good news is that PRSA and the New Professionals section are in the midst of refreshing our mentoring program. Members will be notified by email when updates to the program are made. In the meantime, head over to Mentor Match and introduce yourself to one of the mentors from the College of Fellows. You can also ask your local PRSA chapter or company if they have a program. And if you’re currently job seeking, ask about mentoring programs within the organization. If being mentored is important to you, this is one way to determine if the company culture is going to be a good fit. 4. Make your own match. Look around you. You may not realize it, but you probably have mentors in your life. These people already know you and may have some insight into your situation, work environment, or personal challenges. Look to your colleagues, professors and people in your network to bounce ideas off. If you need someone who is more removed from your circle, leverage existing relationships to find mentors. Explain why you’re looking for a mentor and ask if they know anyone who might be interested in sitting down for a cup of coffee. Stay open-minded about the process–you never know where you’ll find a mentor! How did you find your mentor? In the comments, share your own mentor match story so other New Pros can learn from your experience. 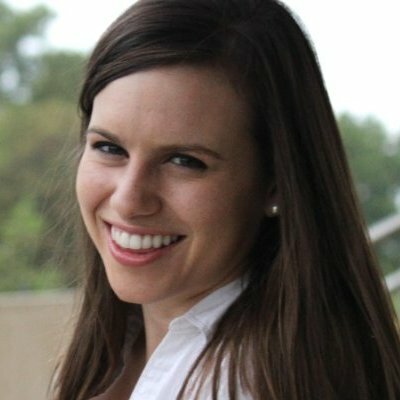 Alyssa Stafford is a member of PRSA Georgia and a communications specialist at Piedmont Healthcare in Atlanta. 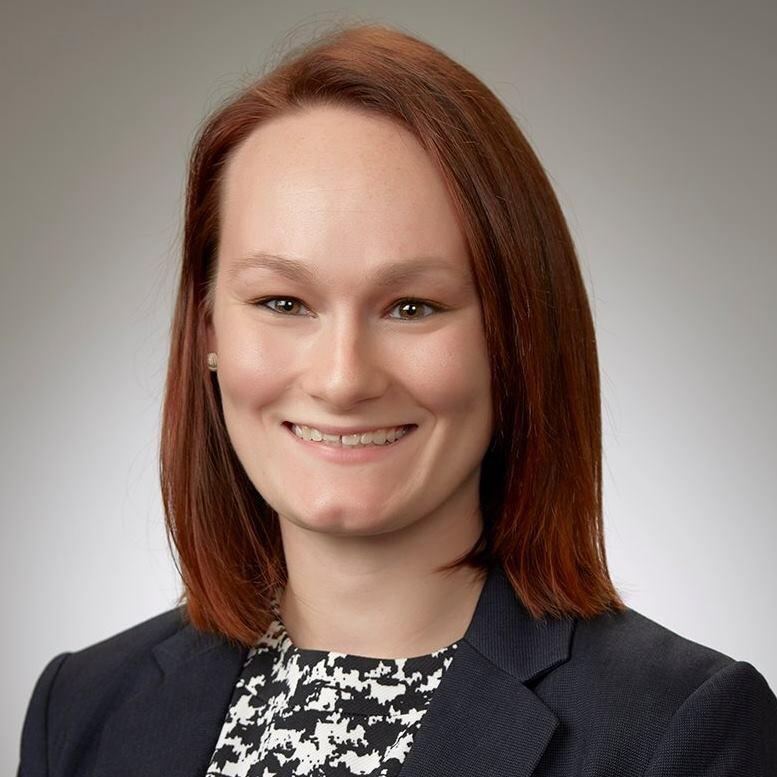 She serves on the New Professionals executive committee as the mentoring chair. 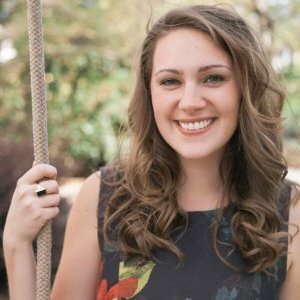 Alyssa is a graduate of Agnes Scott College and the University of Georgia. Find her on LinkedIn orTwitter.